The Heavy Metal series feature select C-6 grade micro-grain carbide and affords excellent value, and long cut-life. 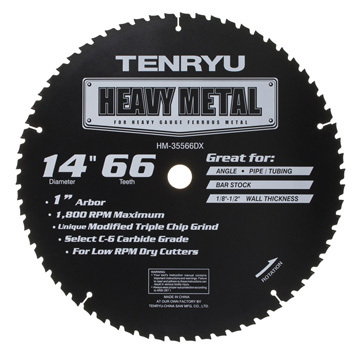 The Heavy Metal Series incorporates an industry-leading super thin-kerf design; triple-chip grind (TCG) and modified triple-chip grind (MTCG) tooth geometries, and is well suited for job-site and shop applications. Our newest offering for your Metalworkers! Both the HEAVY METAL and the HEAVY METAL PLUS are designed for users seeking affordability, quick cutting, and long cut-life; especially in heavier mild steel profiles and plate. Industrial staircases, railings, mezzanines, platforms, grating, trailers, strut, etc.